With a strong focus on Art and Design practice, the Fashion and Textiles Subject Area is a significant contributor to cultural enrichment, social dynamics and economic vitality. This Subject Area is based upon core research skills, knowledge and projects that are built upon staff expertise, post graduate research and the school’s heritage. Our research is dynamic and imaginative, we have an outward looking research culture, with a strong focus on art and design practice as a significant contributor to cultural enrichment and social dynamics. 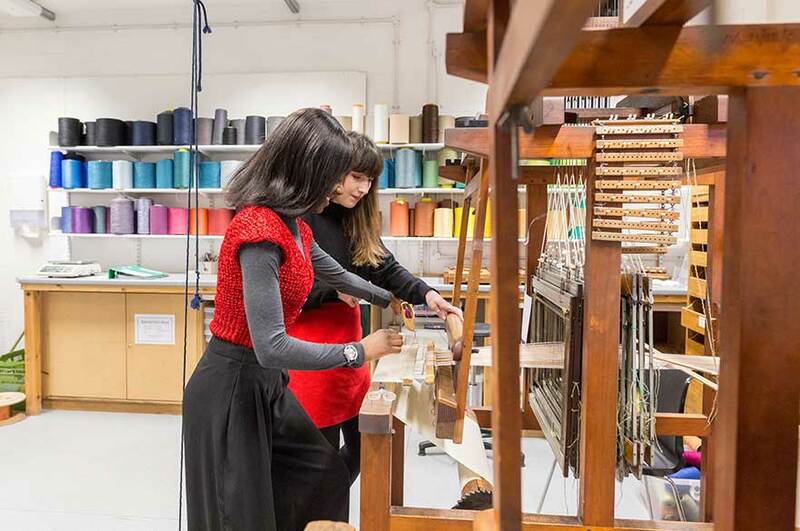 The Advanced Textiles Research Group is a thriving research group at Nottingham Trent University. NTU is a leading institution for advanced textiles research with a global reputation for designing electronically active wearable technology. The Advanced Textile group's research includes work on Electronically Active Yarns, Flexural Composites, Advanced Knitted Technology and Advanced Weaving Technology. The Digital Craft and Embodied Knowledge research group aims to develop craft based frameworks for investigating and extending the scope of new design, visualisation and manufacturing technologies. To date, this has been achieved by synthesising practical methods for identifying and recording the embodied practices found in traditional hand, machine and digital making. Craft is positioned as both discipline and concept, through investigations that address local and global concerns and seek to manifest the changing role and value of creative production in commercial and community contexts. The Global Cultures of Textiles and Dress Group aims to promote research in textiles and dress that addresses a wide range of critical and practice-based themes. Textiles and dress are part of daily human experience and yet their familiarity belies complex social, cultural and historical circumstances. A major focus of the group’s work is to explore the significance and meaning of textiles and dress across cultures and time, and to contextualise them as potent aspects of material and visual culture. The Lace Heritage research group has built a strong team of experts in Lace History and Contemporary Creative Practice able to deliver innovative cross-disciplinary research, which informs design education and teaching locally, nationally and internationally. Since the mid-eighteenth century the lace industry played a major role in forming communities around the world. It was responsible for shaping the urban landscape of the City of Nottingham, not only physically, but also socially and culturally. The legacy of Nottingham’s lace is at the heart of our research and practice. Sustainable Consumption is a multidisciplinary research group that focuses on people's influence on sustainability as users of products and services, ranging from consumer durables and clothing to buildings. Members apply theoretical and practical knowledge from design and related disciplines to environmental and social sustainability, often integrating expertise in design with research frameworks drawn from the social sciences.